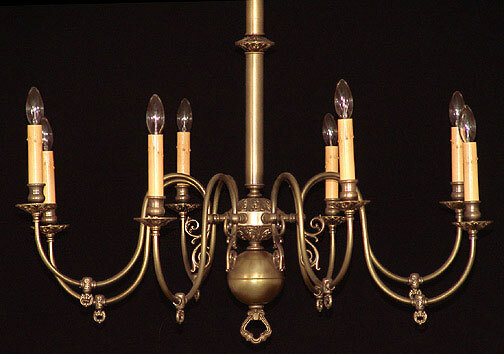 This elegant, Museum Quality 8 arm antique brass Williamsburg chandelier is just right for your formal dining room or larger foyer or entrance area. Just magnificent! Hand shaped arms alternate in height adding more depth. Cast brass realistic gas keys, arm backs and large cast center body add detail. Each candle is seated within a cast brass cup on top of a decorative cast bobeche.